WONDERFUL! For a perfect, soft sugar cookie, the following small modifications will get you there...use butter instead of marg, and melt it over the stove. It helps to dissolve the sugar, and to help sugars and butters cream better. Use only 3 cups flour. Finally, oven temp at 350 and baking cookies for 8-10 minutes keeps it soft. Lining with parchment paper also helps. Keep an eye out...they will seem too pale to remove from the oven, but just when the center doesn't look "wet" anymore, it is done. They still bake for 2 or so minutes, so they will darken up a little and be perfect. 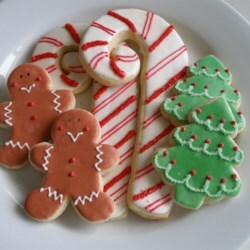 FYI--when rolling these out, keep the dough nice and thick...the cookie will be crisp (still good)if it is too thin.